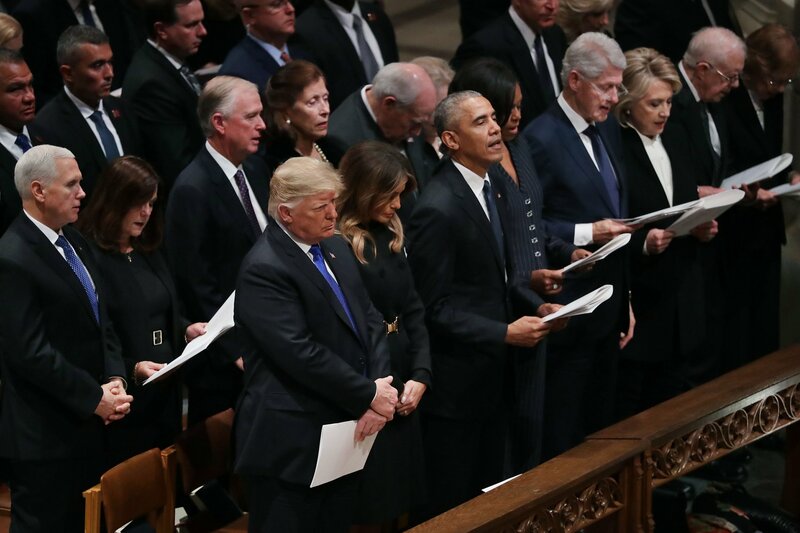 A number of others commented on the past presidents reciting the religious text and singing hymns while Trump stayed silent. For instance, Philip Rucker of The Washington Post tweeted: "The differences between Trump and his predecessors are evident in ways big and small. 39, 42 and 44 are singing along to the hymn, but 45's lips are not moving." Trump earned about 80 percent of the evangelical vote in 2016's presidential election and has touted public support from religious Christian leaders like Jerry Falwell Jr.
Bush, the 41st president, died at the age of 94 last week. His son, 43rd President George W. Bush, remembered his father fondly in a eulogy on Wednesday—saying his father was now with his wife and daughter who had passed before him. "Through our tears, let us know the blessings of knowing and loving you, a great and noble man. The best father a son or daughter could have," Bush said. "And in our grief, let us smile knowing that dad is hugging Robin and holding Mom’s hand again."